This report describes the results of a survey carried out with a range of citizens across Europe including students, non-formal/lifelong learners, the unemployed and employees in a range of industries. The survey focused on participant engagement with Massive Open Online Courses (hereinafter MOOC) and was conducted between April and September 2016 as part of the EU co-funded BizMOOC project which investigates the potential of MOOCs for the world of business. 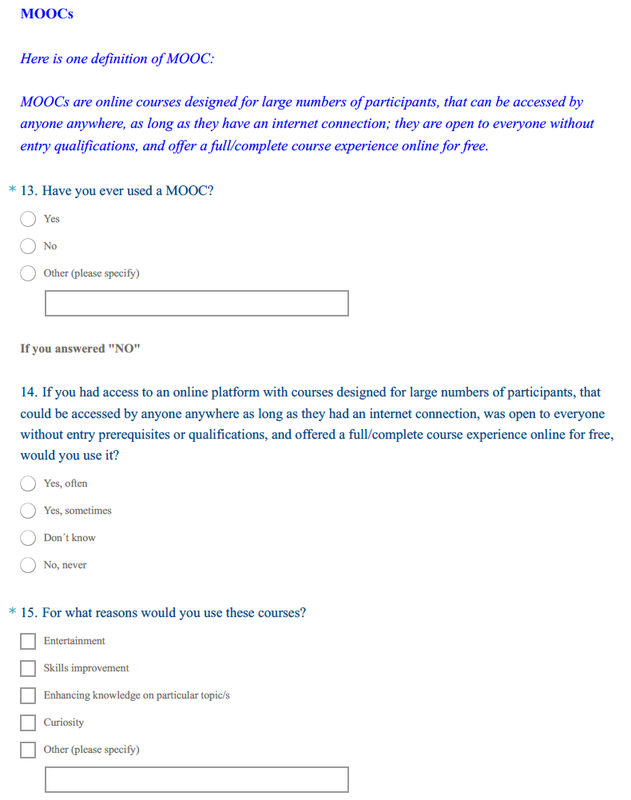 The aim of the survey was to examine (potential) learners’ perspectives of MOOCs. In particular, the survey focused on learning preferences and experiences of participants with regard to MOOC and information and communication technology (ICT) more broadly. 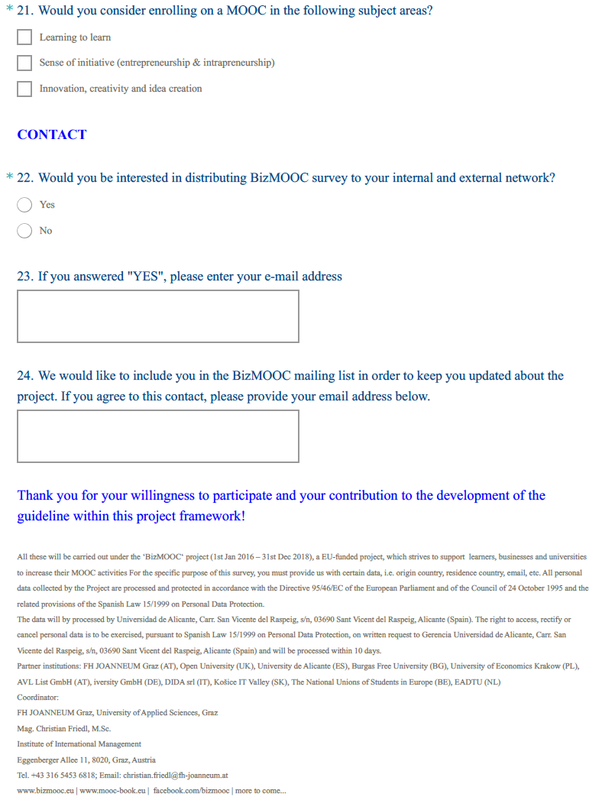 The survey also asked participants for their views of the MOOCs that the BizMOOC project will produce collaboratively in 2017. Three MOOCs will be designed and offered in accordance with the needs and gaps determined from the research carried out through the society survey and the interviews performed within higher education institutions and different types of organisations (as presented in two corresponding reports). With increased global awareness of the MOOC movement over the past 5 years, we expected to see a high level of understanding of MOOCs from survey participants. However, in fact only 40% of the BizMOOC survey sample currently use MOOCs and about 55% have not used a MOOC. This can be contrasted with 84% of participants who use the Internet for developing their skills and/or to learn something new. In spite of this, 85% of the sample who do not currently use MOOCs are planning to do so in the future. The three MOOCs to be designed and offered by the BizMOOC project were regarded as eye-catching by the respondents. However, 70% of the sample intends to participate in the MOOC focused on ‘innovation, creativity and idea creation’ whilst 51% and 42% of participants reported an interest in ‘learning to learn’ and ‘sense of initiative (entrepreneurship & intrapreneurship)’, respectively. More generally, face-to-face rather than online courses were still preferred by participants and those surveyed expressed a general preference for blended learning for professional skills development. However, for independent or non-formal learning, learners indicated that online courses and video platforms were the main sources of online learning content. Our research revealed that whilst the low-cost or free at the point of use characteristic of MOOCs is seen as an important benefit by most of those surveyed, the massive (open to a large number of participants) aspect is not seen as a motivator for participating in MOOCs. Despite a growing awareness of Massive Open Online Course (MOOC) by large parts of society as well as of its importance as a tool of getting the global educational system further than the already known lifelong learning (Skiba, 2012), there is erratic knowledge and use of MOOCs across the world. A similar pattern can be seen at European level (Jansen and Schuwer, 2015) and whilst there is room for improvement in all regions, this is particularly the case in Eastern Europe where MOOCs are still under-employed (Dumitrescu, 2015). In January 2016, a project “BizMOOC – Knowledge Alliance to enable a European-wide exploitation of the potential of MOOCs for the world of business” (hereinafter BizMOOC) was launched with the support of the European Commission (EC) which aims to enable businesses, society (labour force) and universities to increase their activities and better exploit the potential of MOOCs. BizMOOC specifically focuses on work force and higher education (HE) training and the acquisition of key labour market competencies through the application of new methodologies for online teaching and learning. To facilitate this aim, BizMOOC will develop common standards and frameworks on MOOCs which reflect the experiences of HE, business communities and citizens. The first phase of the project was dedicated to the creation of a common body of knowledge and identification of the needs of the three target groups: HE institutions (HEIs), business communities/employers and citizens (which includes the employed, unemployed, students and life-long or non-formal learners). To identify the needs and existing gaps in provision for citizens, an online survey was developed and translated into nine different languages in order to enable the widest participation possible. The following report summarises the findings of this research with regard to training, education, professional development and human resources development (HRD). Using the findings from this survey, the BizMOOC consortium intends to determine European citizens’ perspectives of MOOCs. All eleven partners of BizMOOC were involved in the design and the distribution of the survey using their existing networks and new connections including those developed as part of the accompanying BizMOOC project interviews carried out with HEIs and business community representatives. As a result, more than 1100 persons answered the BizMOOC survey. Specific aspects of online learning and MOOCs. Interest in participating in the courses produced under the BizMOOC umbrella. To ensure the survey was accessible to as many people as possible, the English version was translated into nine different languages: Italian, Slovak, Russian, Polish, French, Romanian, Spanish, German and Greek. Aside from the English version, the Slovak, Polish, German, Spanish and Italian versions were the most used by people living in the countries in which those languages are spoken. The survey was distributed from April until September 2016 via email and social media networks (Facebook, twitter, LinkedIn, etc.) of the partners in the BizMOOC consortium, as well as through additional contacts and networks of the people interviewed as part of the project. The BizMOOC project set a target of 1,000 respondents to the survey, but 1,193 people responded overall (see Table 1). To this end, 24 closed questions were designed and included within the survey (Annex 1 contains more details in this sense). Table 1. Summary and research design. Source: Source: BizMOOC. The results presented here address each of the three parts of the survey. Among those who received and responded to the survey, both inside and outside of the European Union, more than half originate or reside in Austria, Poland and Slovakia. 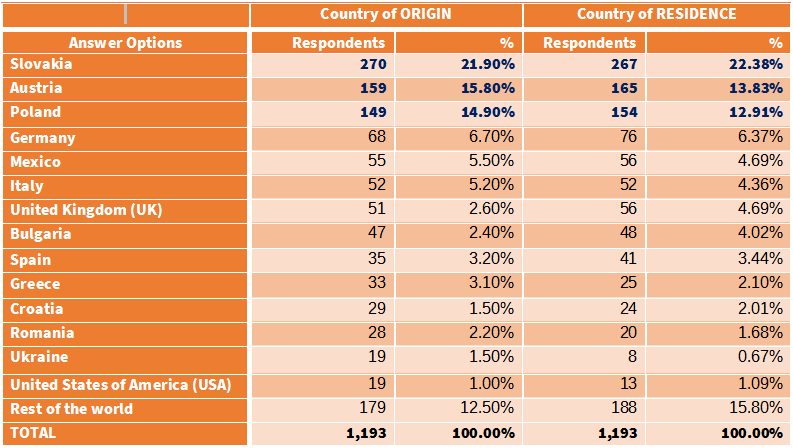 However, respondents from the eleven countries listed in Table 2 make up 84% of the sample. Table 2. Structure of the respondents. Source: BizMOOC. The majority of respondents are aged between 18 and 55 years, with a roughly equal division in terms of gender with a smaller advantage of female representation (see Table 3). The respondents are highly educated, with more than 70% holding at least an undergraduate degree. A high percentage of respondents identified themselves as either employed and/or students. Table 3. Structure of the sample. Source: BizMOOC. More than 84% of respondents declared that they use the web often or always to develop their skills and/or to learn something new (see Table 4). Furthermore, for respondents who did not use the web for learning something new, the majority (71.3%) declared they would use it often and only 1.3% stated they would not use it at all. Table 4. The use of the web for skills development and for learning something new. Source: BizMOOC. When asked which resources would they use to learn something new online, YouTube videos, specific tutorials and open training/open content were most prominent responses (see Table 5). More than 200 respondents also considered using other online resources such as scientific blogs and academic articles, Moodle platforms with specific content, licensed materials, scholar Google and MOOCs (counting with over 11%) to learn something new. Table 5. Resources most used for learning something new online. Source: BizMOOC. Despite the evolution of information and communication technology (ICT) over the last few decades, the data suggests face-to-face courses are still preferred over online courses. More than 70% of the sample prefer to use them for developing their professional skills for their current or future job role, whereas 60% of the sample opt for online courses. This suggests, at least partially, society is considering a blended use of both face-to-face and online courses for professional skills development. When asked about preference for learning on one’s own or with other people, almost 60% of the sample considers that the best way for them depends on the circumstances and on the content. Nevertheless, if they opt to learn on their own, online resources, online courses and video platforms are the sources of content preferred by the majority (see Table 6). Over 100 respondents also mention other sources of content for learning on their own, with scientific articles, blogs and journals being the most relevant ones followed by social media content. Table 6. Sources preferred for learning alone. Source: BizMOOC. Even though MOOCs were first introduced to the education/training system in 2008, over 55% of the sample have never used a MOOC. Under 40% of the sample are using MOOCs for acquiring new information/knowledge and new skills online. YouTube videos, tutorials recommended by specialists in the field and open training/content are the preferred options. Table 7. Sources of acquiring new information/knowledge and skills online. Source: BizMOOC. In terms of expectations, data suggest MOOCs provide a better understanding of an aspect related to a specific subject; to get low-cost or free opportunities for learning; and to have the most up-to-date information on a specific subject (see Table 8). Table 8. Expectations from MOOCs. Source: BizMOOC. In respect of the perceived benefits of MOOCs, personal development which contributes to improved job performance, personal improvement, and the development of skills for a potential new job are those most highlighted by the respondents (see Table 9). Table 9. Benefits of MOOCs for the society. Source: BizMOOC. The elements of MOOCs most relevant for personal development according to our sample are depicted in Table 10. Data suggest that the low-cost or for free acquisition of new knowledge and skills is the most important aspect for people in relation to personal development. 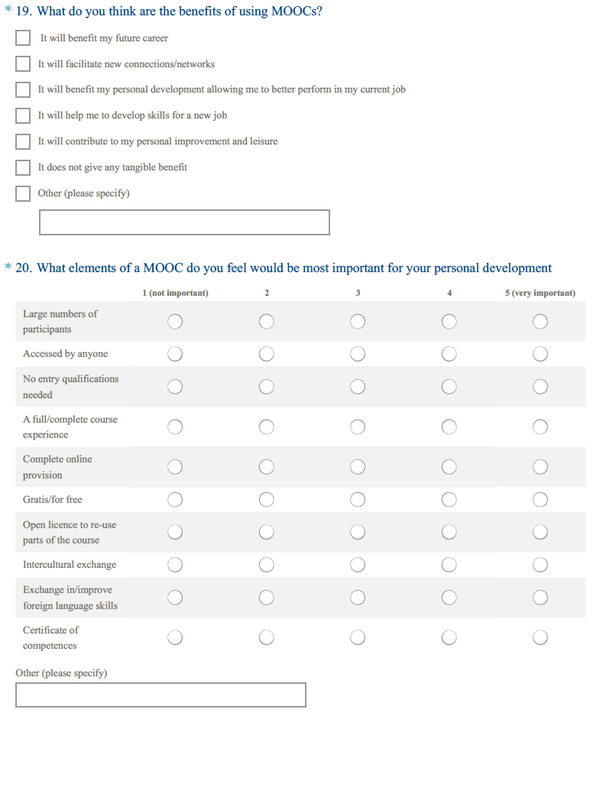 The fact that MOOCs are massive (open to a large number of participants) appears to be irrelevant as only 79 of respondents (out of 1,193) marked it as very important for personal development. Table 10. MOOC´s elements most relevant for personal development. Source: BizMOOC. Approximately 85% of respondents would participate in MOOCs sometimes or often if they were to have access to an online platform with courses designed for large numbers of participants that could be accessed by anyone anywhere as long as they had an internet connection, was open to everyone without entry prerequisites or qualifications, and offered a full/complete course experience online for free (see Table 11). Table 11. Interest of using MOOCs. Source: BizMOOC. The respondents identified the improvement of their skills and enhancement of knowledge on particular topic(s) as the main reasons for participating in MOOCs. This was followed by curiosity (see Table 12). Table 12. Reasons of using MOOCs by the respondents. Source: BizMOOC. The BizMOOC project has committed to designing and producing three MOOCs that will be made openly available to learners. Each MOOC will cover one specific theme. More than 70% of the respondents are interested in participating in the MOOC on ‘innovation, creativity and idea creation’, whereas the MOOCs on ‘learning to learn’ and ‘sense of initiative (entrepreneurship & intrapreneurship)’ are considered by 51% and 42% respectively (see Table 13). Table 13. Interest in enrolling the MOOCs offered by BizMOOC. While 84% of respondents currently use the web for developing their skills and/or to learn something new, around 40% are using MOOCs already and about 85% are planning to do so in the future. Thus, after more than half a decade of MOOCs trending, citizens across Europe still do not view MOOCs as mainstream. The reasons for this are varied: universities employ different methodologies, generational differences and a tendency toward more traditional training and personal development methods by some business communities and employers. The first important sample observation was – particularly when referenced to existing research on the educational attainment of those who use MOOCs (Sharples et al., 2013; UNESCO, 2013; Ho et al., 2015; Online Course Report; 2016; etc.) – that employees and students between 18 and 55 years old with at least an undergraduate degree represent the majority of those surveyed. Despite the drift towards modernising training and teaching/learning methods via the use of ICT, face-to-face courses were still preferred by survey participants. Yet, learners generally preferred a blended user setting of both face-to-face and online courses for professional skills development. Only in instances of independent or non-formal learning was there a small preference for online learning. Participants identified video platforms and online courses as the preferred formats for self-directed learning content with the most used resources being: YouTube videos, specific tutorials and open training/open content, scientific blogs and academic articles, Moodle platforms with specific content, licensed materials, Google Scholar, MOOCs and Social Media content. Although our sample valued MOOC offering low-cost or free opportunities for learning and acquiring up-to-date information on a specific subject, more than 55% have not yet used MOOCs. However, 85% of participants indicated that they were likely to use MOOCs regularly or occasionally, in future. Regarding the main reasons for participating in MOOCs, improving skills and enhancing knowledge on a particular topic(s) were underlined – independently whether the respondents had previous experience in using MOOCs or not. Respondents with no previous MOOC experience highlighted curiosity as one of the main reasons for participating in MOOCs. 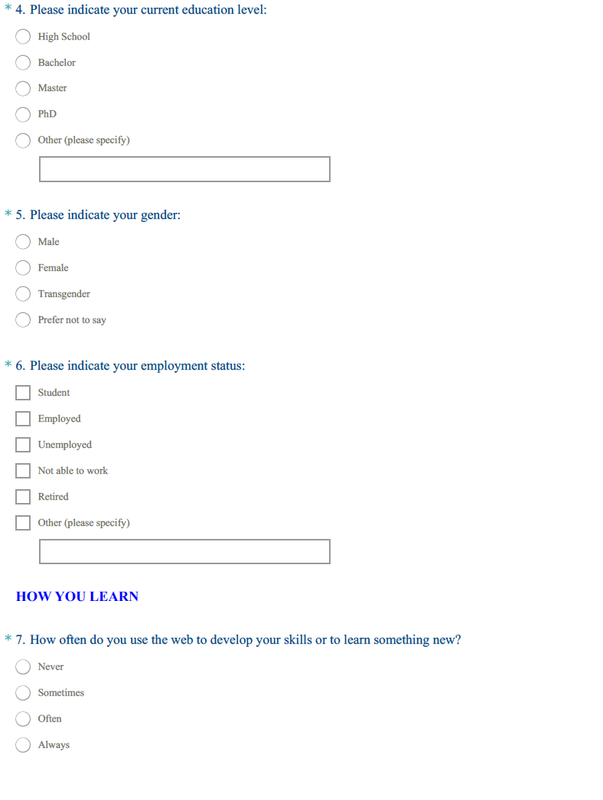 According to the respondents, the potential of MOOCs of improving personal development and the development of skills for a potential new job seem to be of high relevance when choosing this kind of informal education tool. The fact that MOOCs are massive (open to a large number of participants) appears to be irrelevant as less than 6.62% of the respondents marked it as very important for personal development. Among the three MOOCs to be developed and offered by the BizMOOC project ‘innovation, creativity and idea creation’ was considered of interest to 70% of survey respondents. The other two MOOCs, ‘learning to learn’ and ‘sense of initiative (entrepreneurship & intrapreneurship)’, where considered of interest by 51% and 42% of the BizMOOC sample, respectively. This research is conducted as part of the European Union-funded project BizMOOC – Knowledge Alliance to enable a European-wide exploitation of the potential of MOOCs for the world of business (Ref. 562286-EPP-1-2015-1-AT-EPPKA2-KA). We would like to thank all partners in BizMOOC for their contributions. However, sole responsibility for this article lies with the authors, and the Commission and BizMOOC partners are not responsible for any use that may be made of the information contained therein. BizMOOC (2016). BizMOOC – Knowledge Alliance to enable a European-wide exploitation of the potential of MOOCs for the world of business, EU-Project in the Erasmus+ programme, Key Action 2, Knowledge Alliances, Reference Number 562286-EPP-1-2015-1-AT-EPPKA2-KA. Sharples, M., McAndrew, P., Weller, M., Ferguson, R., Fitzgerald, E., Hirst, T., and Gaved, M. (2013). Innovating Pedagogy 2013: Open University Innovation Report 2.Milton Keynes: The Open University. Skiba, D.J. (2012). Disruption in Higher Education: Massively Open Online Courses (MOOCs), Nursing Education Perspectives, 33 (6), 416-417.